I hope you had a lovely Mother's day weekend... Ours was filled with 2 pop-up shops at local markets. Lots of loading/unloading, ray of Southern California sun (especially on Sunday)... and great customers! I was so exhausted last night... that I was in bed by 8pm. We woke up this morning feeling pretty fantastic so we decided to have a small belated mother's day breakfast together. 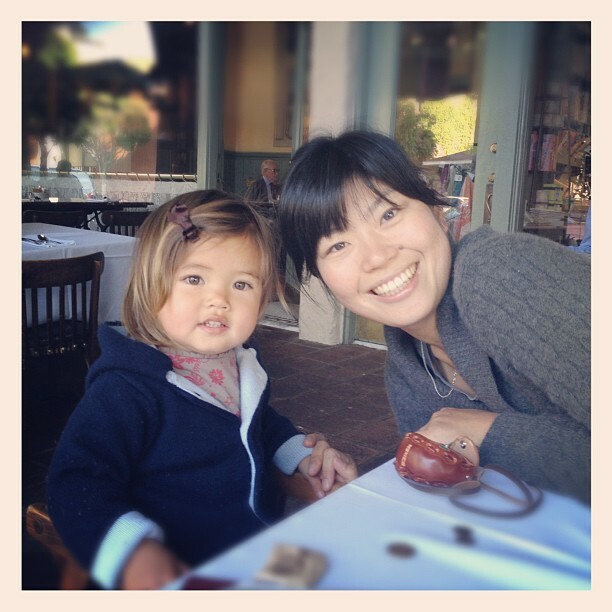 (photo from Julienne, our favorite breakfast place in South Pasadena). Our roo is becoming much more independent... and we are growing to become great companion for each other. We play "silly" and giggle with each other, sing songs together and take care of the garden... Lunch is nicer with two of us and so as afternoon reading time. The truth is... that being a mama is so awesomely amazing... that I would love to thank you, my little roo, for everything you have given me.